The corridor was built by a man called Giorgio Vasari, who was an architect for the court of the Medici family. Around the same time, the Medici family had just purchased a large villa on the bank of the Arno river (Pitti Palace), while enjoying the title of the Dukes of Florence. This family lived in the Pitti Palace, while their “office” if you will, was the Palazzo Vecchio. The family’s wish was to move between their house and “office” without facing any dangers, and free to look upon their subjects without being spotted. If you would like to learn more about the Medici family, a book called The Rise and Fall of the House of the Medici by Christopher Hibbert is highly recommended. Taking just 5 months to build in 1565, the Vasari Corridor was ready just in time for the wedding of the son of the Duke Cosimo I de’ Medici and Joanna of Austria. To walk through the Vasari Corridor, you’d pass through the halls of the Uffizi gallery, cut through the Arno river, pass over the goldsmith’s shop located on Ponte Vecchio, cross the gardens of Palazzo Guicciardini, and then make your way out at the Boboli gardens. The Vasari Corridor was even featured in Dan Brown’s hit novel Inferno; used by a professor and a Dr to escape soldiers. Nowadays, you can take tours yourself through this mystical corridor, a definite must if you’re visiting Florence! You can see unique portraits inside the corridor which actually seem to give you a little peek into the minds of the artists. Eerily quiet inside the corridor, it’s comparable to Dr Who’s Tardis; much bigger on the inside than you would expect. Straight off, you’ll notice other pieces of Florence’s history, such as the artwork damaged by the mafia bomb set off under the gallery in 1993. The bomb killed 5 people, and the damaged works of art were later pieced back together to serve as a reminder to visitors. You should take your camera with you to get some memorable shots, however, you can’t take pictures of the artwork from inside the corridor – only from outside of the windows. You’ll end your tour in the Palazzo Pitti’s garden, located next to something called the “Grotto of Moses”, where in the summer various jazz shows are held. This is a beautiful and perfect place to finish your tour; you might even feel like a Medici for a minute! 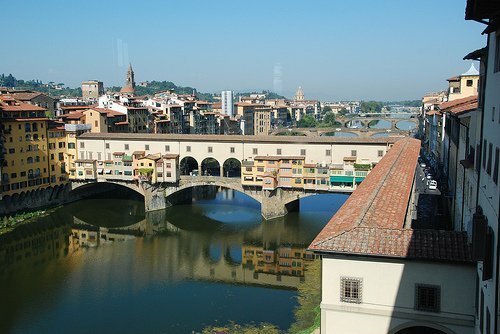 The Vasari Corridor is a truly unique place and a great experience to get under your belt – it’s highly recommended that you add a visit to your bucket list of things to do! Matthew has been writing about the Arts and culture for Interesting Everything since 2012. Having graduated an Arts History major from Berkeley in the late 60's he now spends his retirement writing about 18th century painters, surfing with his partner, and occasionally posting the odd article on Interesting Everything. He lives in oceanside, california.